Dummy movement was well controlled. The driver side curtain airbag deployed during the crash. After the dummy moved forward into the frontal airbag, its head contacted the dislodged headliner above the side curtain airbag. 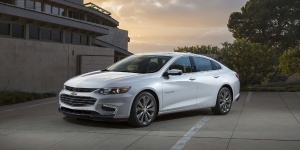 Get the best price for the Chevrolet Malibu of your choice from a dealer in your area. Request a price quote now.